I’ve written it before, but full disclosure requires me to reiterate my biased stance toward Joey+Rory. Their debut album with Sugar Hill Records was organic and delightful. They were my first and only (so far) interview for Country Universe. Anyone who is aware of the down-to-earth couple can instinctively assume that they were genuine and gracious and made the experience one of the highlights of my Country Universe tenure. Therefore, I will not feign detachment regarding the trajectory of their career. I simply want them to succeed and I make no apology for my steadfast position on the matter. The reality is, however, that a song like this, one that serves the purpose of pleasing a crowd of diverse people in just a few stanzas, is a touchy balance to strike. It doesn’t always work, especially when it’s perceived as pandering instead of authenticity. Of course, perceived authenticity is a matter of subjectivity. Perhaps it’s my bias, perhaps it’s tangible sincerity, but it seems that Joey+Rory, with a close call, somehow strikes just the magic balance. Great review. It’s a really cool-sounding single and I probably won’t gripe if it’s successful, though it does cross firmly over the pandering line for me, much the same way Brown’s “Chicken Fried” did. I listened to this song twice and I hope to never hear it again. I agree with Dan about crossing the “pandering line” as “Chicken Fried” did (I skip CF when I play my ZBB cd.) but I don’t think it’s cool sounding. If J&R’s outstanding debut cd had been more successful, they probably wouldn’t have felt the need to come out with a song like “This Song’s for You”. This song is for them. I definitely see your point. I even agree that it’s pandering, as far as they know it’s going to be a crowd pleaser, but I don’t quite put it in the same league as “Chicken Fried.” “Chicken Fried” was very random with the soldiers reference while “This Song’s for You” at least stayed focused in celebrating the people within their audience base, which seems much less out of left field. I freely admit, however, that I might not like this song if it were from another artist, though I don’t think that J+R are the only artists that I would accept it from either. I do get a bit of a pandering vibe from this song, but it does retain some desirable qualities that Joey + Rory’s music has always had. Judging by vocals and instrumentation, it sounds great. Thank goodness there are no overblown Rascal Flatts-like guitar solos. It’s good to hear Rory do some more singing, I might add. I didn’t like this song as much as I wanted to, but it might grow on me. I’m afraid it’s not reflected in the writing, but the grade of B+ is to show that I like the song, but that it’s definitely not perfect. I don’t want to hear a bunch of stuff like this from them, but I’m okay with one. …i had to wash this thing down with the chesney tune. it is horrible form a to z but joey is a mighty fine singer. At least this is a song that I knew full well that a lot of people wouldn’t like, unlike my surprise about the Rimes single. Love this song; its another high quality delivery from my favorite country music duo. I can’t wait for the second album, because their first was spectacular, and I’m glad this single is likely to be a successful radio hit for them. I like this song. Did you guys get the Loretta Lynn cover with it too from iTunes? I absolutely fell in love with the song the first time I heard it. Maybe it was because it was a live performance. Very easy to get swept away by all the emotion when you see them sing it live. It comes across very real in that setting. Don’t know if the song will have the same impact on radio. I would love it if it does, but this might be a song that is best reserved for live shows. Yes, it definitely seems like more of a live show song. They obviously wrote it for that audience, as the lyrics refer to a stage and such. I’ve read that they’ve been doing it at their shows and the response was so positive that they decided to record it. You obviously don’t know J+R very well if you’re giving this song a B+. J+R should’ve used their last lifeline on a live cut rather than this studio made up sound. Rory’s voice is way over produced & fake. There’s nothing about this song that is a genuine feeling. Trying to jump on a Zac Brown ride is a terrible mistake. But you say the song oozes with sincerity. If the artists behind the song are only singing words rather than feeling them, there’s nothing sincere about it. This song was cut because they desperately need a hit. Wrong song for radio & wrong song for J+R. If Zac wouldve released this as a live cut, it’s a #1 in for sure. I really like what they’re trying to say, but I’m just not feeling it with this studio version. I imagine it WOULD feel more sincere and less contrived if I heard it live. All the ingredients are there, (including Joey’s wonderful pure Country voice), but the end result seems to me to be less than the sum of it’s parts. Having said that, I still see Joey + Rory and the ZBB as bright lights and beacons for the salvation of real Country music! Yeah, I think you guys are probably right about the ultimate problem with this recording. While I still believe it’s sincere, I agree that it would work better as a live track. I have no doubt it’s sincere in that the song was composed and performed from the heart, I guess what I mean is that it comes accross as a bit formulaic. Yup, it’s formulaic; I’d even say very formulaic. I’m not against songs that are formulaic as a principle though, as long as it somehow works. Of course, most people here don’t think it does, but I can live with that. Kathy Mattea’s “Where’ve You Been”, Conway Twitty’s “That’s My Job” and Patty Loveless’ “How Can I Help You Say Goodbye” are all as formulaic as you can get, but they’re all wonderful songs. I think there’s a difference between formulaic, which is okay, and generic, which isn’t. Of course, this is all in the world according to Leeann. Just bought this song on itunes. Included w/ it is a cover “You Ain’t Woman Enough.” Well worth the .99! How is the performance on the song fake? Who can even quantify this? Music is inherently subjective but to state what the motivation of any artist is when they record/release a tune, is just silly, unless there’s a track record of an artist (IE Stated) doing stuff purely for $$ reasons. IF J+R were releasing this song purely for $ or to ‘piggyback’ why would they have decided to give it away for free? Music is inherently subjective but to state what the motivation of any artist is when they record/release a tune, is just silly, unless there’s a track record of an artist (IE Stated) doing stuff purely for $$ reasons. I appreciate you sticking up for them, as someone who thinks they do seem sincere, but I figure I might as well answer your question before somebody else does. I’m sure you already know this, but giving the track away for free is a pretty common strategy in order to gain momentum for a single. Of course, if a single does well, it typically translates to better record and ticket sales. A question I have is: Do artists make any money off the digital downloads of singles? Yes, they do – if they’re on smaller labels (or in 360 deals now). 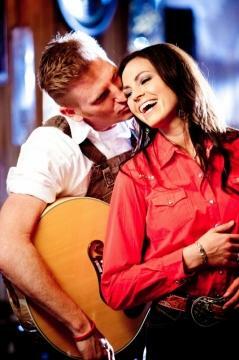 An artist like Joey+Rory is in even better situation because of their smaller label and success. So, to give away a song may help gain momentum but it’s also going to lose them money – at least at first- because many people who want the song will get it, especially because it’s for free. I should clarify that when I said J+R are in an even better position, it is because their costs aren’t nearly as high (for promo or recording) as majors or even big indies like BBR or Big Machine. Now, to get at an answer for the digital sales thing. Lets say a somewhat popular single sells 100,000 copies at 99 cents per unit. That nets the label about $70,000. An artist on a smaller label like Joey+Rory will see some of that money come their way. Now if the artist is on a bigger label, they’re likely gonna need to sell 500k-1 million singles to see any money as it takes about that much to promote ONE single to radio. So, the short answer is, yes, they make money. It just depends on how much a single sells and what kind of contract the artist is signed to. Love the production-so many country artists should take note. The lyrics leave much to be desired-the base is too reliant on cliches and it’s painfully unoriginal. What makes you say that, Steve? I’m always skeptical of anyone who says a certain artist is “the savior of country music.” One or two artists cannot change an entire genre of music. Joey +Rory/ZBB/Jamey Johonson and the like may be less pop-oriented and have stronger song lyrics than the typical artists and songs pandering to radio, but that mean they’re hollier than thou. Well K, that was just a bit of hyperbole and somehwhat overstated on my part. I just mean they’re a breath of fresh air with their Traditional sound, and hopefully THEY will become the trendsetters, as opposed to those who now dominate the charts with what I consider to be extreme pop-diluted country, or bombastic, overproduced cliches masquarading as music. I also see Jamey Johnson and Miranda Lambert as torch-bearers for what I consider to be the good stuff, and they give me hope for the future of the genre, though Miranda is not strictly a Traditionalist.